IBSA announced today that the US Food and Drug Administration (FDA) has approved Tirosint-SOL (levothyroxine sodium oral solution), a liquid form of levothyroxine for the following two conditions: hypothyroidism and TSH suppression in the management of some thyroid cancers. 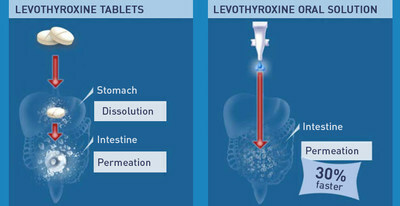 Levothyroxine, the synthetic form of the thyroid hormone thyroxine, is used in all cases of thyroid deficiency. It is on the list of the World Health Organisation's essential medicines, and is among the most effective, safe, basic and one of the three most widely prescribed medications in the world, as well as the second most prescribed in the United States. It is also used in the treatment of children in cases of congenital hypothyroidism, and it is important to evaluate whether it may be required in pregnancy, as thyroid hormone deficiency can cause miscarriage and adversely affect a child's neurological development. "Liquid levothyroxine was developed by IBSA, an Italian-Swiss company and is available in the Italian market since 2012, notes Arturo Licenziati, President IBSA SA. Italian endocrinologists determined the success of the medication through proposing and implementing clinical trials which, within only a few years, were published in a large number of international scientific journals. The FDA approval of Tirosint-SOL (levothyroxine sodium oral solution) for the US market opens up very interesting opportunities for our company: a market of 18 million patients, estimated at 2 billion dollars to 105 million prescriptions. It will be available on the American market within 6 months." "Hypothyroidism, explains Leonard Wartofsky, MD, MACP, Past President of the American Thyroid Association, is widespread in the United States: it is estimated to affect at least 6% of the population and the most frequent cause is chronic autoimmune thyroiditis. The disease, if not identified and properly treated, is associated with a greater cardiovascular risk, infertility and complications in pregnancy and of the foetus. Thyroxine was identified in 1914 at the Mayo Clinic by Edward Calvin Kendall, as extracted from porcine thyroid, and was made available in the United States from 1927. It only became available in the synthetic form, which ensures a precise measure of the hormone, in 1950. The synthetic form, traditionally produced in tablets, has now undergone a major innovation after 70 years with the development of the liquid form. The precise observance of the recommended dose of levothyroxine is essential to health. The absorption of levothyroxine by the body is affected by interference from gastritis, coeliac disease, lactose intolerance and the intake of certain foods such as coffee and medications such as commonly taken antacids." "The development of a preparation, which allows these restrictions to be overcome and enables the achievement of the target (TSH) within the established limits, has long been the IBSA's target" adds Licenziati. Clinical trials in Italy have demonstrated that with liquid levothyroxine, the requirement of waiting an hour before eating breakfast may be avoided. Many frequently used medications, such as antacids or proton pump inhibitors, do not appear to interfere with absorption of the liquid preparation. And this preparation is certain to enjoy popularity with its application for the treatment ofpatients who cannot swallow or who are fed by tube, or for children with hypothyroidism.